I start this piece with the admission that I have been an abject failure. With the Alfa’s being produced locally, it should have been easy for me to slide my bottom in one, and in fact I had done this at the Bira circuit day, put on by the local Alfa people. However, I had not done a proper test (I do not write about vehicles that I have just driven round the block and pretend that I can fully understand the car). I tried ringing the local office to speak to “the man” but his super-efficient secretary was obviously making sure that his morning was not spoiled by “coffee interuptus”. But all was not lost, as my mate down-under, John Weinthal, had just spent a week in one of these jiggers. So, after that rather long-winded introduction, here are the Words from Weinthal. “It took 39 years of regularly assessing cars for me to endure the first injury inflicted on me by a test car. Last month was notable also for only my second experience of what is rather quaintly but accurately described as driving in ‘limp mode’. “The injury meant that a big chunk was hacked from the back of my leg. This happened when the sharp lower edge of a new Camry Sportivo front door swung shut and gouged me. A few stitches and two weeks later I now have only a scar to remind me of the event. “Then, right at end of a most enjoyable week’s motoring, the new Alfa Romeo JTS sedan suddenly became pretty listless. It continued to progress - as they say - but City buses easily had its number away from the lights. At the same time, a yellow outline of an engine appeared as a warning symbol in the speedo. The fascia-mounted information centre flashed in red: motor control systems fault - go to dealer. “And so I did, after a few small journeys during which its performance alternated between Alfa hare and wind-up tortoise, but it got us back to the stunning new Brisbane Alfa dealership without any real pain. “According to the John Briggs, Alfa Romeo man in charge of these things, some Queensland (Australia) premium petrol is rather less premium than most other people’s premium. The Alfa’s electronic management system can detect this and slows things down before real damage occurs. Fair enough ... but I am glad I was still in the Metropolitan area. Exactly the same thing happened with an AUD 100,000 BMW 330ci last year. Brisbane BMW’s response was the same. 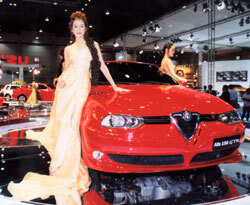 “The Alfa 156 is a compact, stylish four door sedan. Considering its enviable heritage you expect above average driving satisfaction. You will not be disappointed. You might be surprised, however, to discover that you have an extremely economical car in your driveway. This Alfa sports sedan will go more than 600 km on a tank of premium; as good as 6.6 km per 100km on the European standard test. “The 156 is not new by any means - it was the 1998 European Car the Year. However, it has recently had some significant changes including acquiring what Alfa claims is the most advanced engine of its type in the world. I am not sure what ‘of its type’ means, but there’s no doubting that this high tech four is extremely sweet be it around town, sweeping through winding hill country or drifting down the freeway. Power from Alfa’s all-new two litre JTS engine is 121kw - up from 114 for the long-lived Twinspark engine it replaces. Torque is up from 187 Nm to an impressive 206 Nm. The 156 JTS can cover the 0-100 kph run in just 8.2 seconds and go on to a top speed of 220 kph. In typical Alfa style, this new engine loves revs and delivers its best both in performance and aurally when enjoying its upper limits. Effectively it is a four-speeder around town, with fifth gear largely reserved for cruising. “The steering is crisp; the ride is good; the handling will impress most. Not for the first time with an Italian car, the brakes are highly effective albeit a mite less reassuring in feel than most cars. “Standard equipment includes a multitude of electronic suspension and braking enhancements, six airbags, multi-zone climate control air-con, a fascia top information panel (which clearly warned me to get back to the dealer), electronic cruise control, front and rear centre armrest, Blaupunkt six-speaker sound system with controls on the steering wheel and more. “The Alfa has the expected remote central locking, power windows and mirrors and various styling touches which help distinguish Alfas from the common herd. The Alfa is a practical and comfortable fun car. It will appeal primarily to the enthusiast family man rather than your everyday motorist. At AUD 49,950 it is fair value, and the coffee crowd credibility of the Alfa is more akin to that of a BMW, Jag, Audi or Merc. Thank you John, if only we had the availability of test machinery the way they do in Oz. The Alfa 156 range starts here in Thailand around 1.8 million baht. Last week I mentioned that “GT” stands for “Gran Tourismo” - so when was this term first applied was the question? The answer was the long chassis version of the supercharged 1,750 six cylinder Alfa Romeo in 1931. So to this week. There was a very famous F1 engine that was built from a V8 Oldsmobile F85 engine. It won the world championship twice. What was the car it was placed in? Now that’s real easy! Wings and things. Just a boy racer’s dreams? Round town you will see some very odd automotive ideas. Lowly old Daihatsu’s sporting large wings, Hondas with a full British Touring Car Championship wing kit and some with wings that could hold a Boeing 747 aloft for thirty minutes. Do they work? Unfortunately, many of them do, but the price is not only the purchase cost, but also in road holding. You see, if the wing thing is at all efficient, the down-force it can produce at motorway speeds is enough to make the front of the vehicle very light. Taken to its ultimate, this can cause the car to become airborne and actually do a backwards summersault to the chagrin of the drivers. This actually happened a couple of years ago at Le Mans, when the Mercedes racers had too much wing at the back and not enough at the front and looped the loop at around 190 miles per hour! The engineers at the car factories began to understand that something strange was happening to the cars back in the late ’60s, early ’70s. The shape of the vehicles were such that this “new” phenomenon called “Lift” was being noticed. The increasing speeds of road cars brought the situation rapidly to a head, and the aerodynamicists began muttering about how Lift is related to the square of the speed. It was not a linear relationship. The Porsche engineers did much work on this with the early 911 series in the ’70s, when it was found that with increasing speed, the cars became very nervous and lost traction (remembering that Lift is related to the square of the speed). 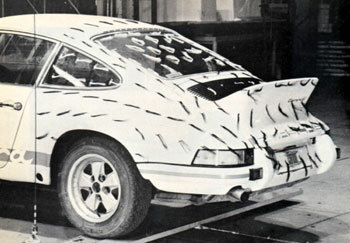 Placing a 911 on wheel scales in a wind tunnel, they could easily demonstrate that as the speed went up, the “weight” on each wheel decreased. They then developed the front air dams and the tail spoilers to decrease the Lift (increase the down-force) at each end. The largest “whale tails” would actually produce so much down-force that a “negative Lift” situation could be reached. Because they were working with complete cars in the wind tunnel, they could also show that there would be a problem with down-force at the back and Lift at the front, which is why they made the spoilers for the front of the Porsches. 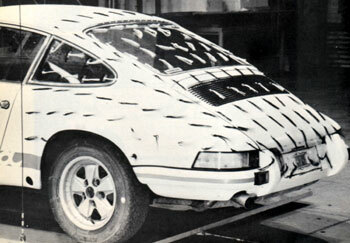 In fact, if you wanted to buy a whale tail from the Porsche dealer, you were forced to purchase the front spoiler too. This was not just salesmanship, it was safety! We understand the aerodynamics much better today and the ultimate expression is the F1 car of today, which generates so much down-force that in theory it can travel upside down and stick on the underside of the tollways. Perhaps that is the answer to Bangkok’s traffic problems! It is always interesting to follow the history of some makes of car. Hupmobile is one, what an impossible name! However, the history of the Hupmobile Skylark is worth repeating. In 1938, Auburn went to the wall and Hupmobile purchased dies, tools and fixtures from the bankrupt car maker, whose inventory also covered E.L. Cord’s dream, the Cord 810 and 812. 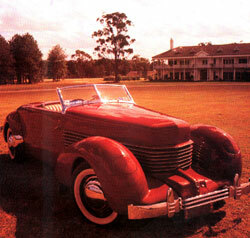 Hupmobile then went ahead and built what was almost a “baby” Cord which they called the Skylark. The prototype certainly looked a lot like the Cord 810 but where the Cord had been FWD, the Skylark was RWD. The Cord also had expensive pop-up headlights, whereas the Skylark’s were fixed and cheap! The car was definitely smaller than the Cords (which were enormous with a 125" wheelbase) being 10" shorter between the axles. It also came with a 6 cylinder engine, as opposed to the Cord’s Lycoming V8. By the time the Skylarks were ready for the first ones to be sent out to the dealers, it was 1939 and the front had been changed somewhat, taking it away from Gordon Buerhig’s classic “coffin nose”. However, things started looking sticky for Hupmobile and they entered into a strange association with the Graham-Paige company, whereby they would build the Skylarks, but in return would get access to the Cord dies. The concept was that Graham-Paige had the capacity in its Dearborn plant to mass produce the Skylarks. And indeed they did produce the car - a whole 320 of them before Hupmobile went into receivership.